TwinScan™ Instruments embody a new concept in twin engine analog instrumentation which sets the ultimate standard for easy readability in the least possible space. Each individual instrument contains port and starboard meters which reference to each other. TwinScan instruments reduce the panel space required by 50% leaving more room for other electronics. TwinScan Fuel Flowmeters and Tachometers are sold separately. Features GPH models available with 0-16, 0-24, 0-32, 0- 50, and 0-100 GPH scales. Color styles include black dial/bezel, white dial/bezel , and white dial/chrome bezel. Requires 1 SPST push button panel switch for resetting fuel totalizer reading. Microprocessor electronics for high performance features like electronic dampening, linear dial scales, superior accuracy unaffected by ground voltage shifts. Patented, magnetically shielded, precision, miniature air-core meter movement with state-of-the-art engineering feature s. Corrosion free stainless steel bezel (black, white or polished) and molded acetal cases which fit standard 3-3/8" diameter holes. Reverse polarity and load dump protection exceeding SAE J1810 standards. 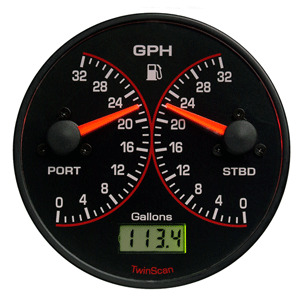 TwinScan™ Instruments embody a new concept in twin engine analog instrumentation which sets the ultimate standard for easy readability in the least possible space. Each individual instrument contains port and starboard meters which reference to each other. TwinScan instruments reduce the panel space required by 50% leaving more room for other electronics. TwinScan Fuel Flowmeters and Tachometers are sold separately. GPH models available with 0-16, 0-24, 0-32, 0- 50, and 0-100 GPH scales. Color styles include black dial/bezel, white dial/bezel , and white dial/chrome bezel. Requires 1 SPST push button panel switch for resetting fuel totalizer reading. Microprocessor electronics for high performance features like electronic dampening, linear dial scales, superior accuracy unaffected by ground voltage shifts. Patented, magnetically shielded, precision, miniature air-core meter movement with state-of-the-art engineering feature s.
Corrosion free stainless steel bezel (black, white or polished) and molded acetal cases which fit standard 3-3/8" diameter holes. Reverse polarity and load dump protection exceeding SAE J1810 standards.